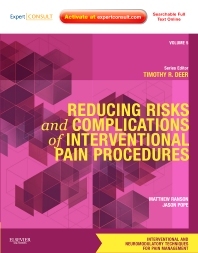 Reducing Risks and Complications of Interventional Pain Procedures - a volume in the new Interventional and Neuromodulatory Techniques for Pain Management series - presents state-of-the-art guidance on avoiding pitfalls and optimizing outcomes. Matthew Ranson, MD, Jason Pope, MD, and Timothy Deer, MD offer comprehensive, evidence-based advice on selecting and performing these techniques - as well as weighing relative risks and complications. With access to the fully searchable text at www.expertconsult.com , you’ll have the detailed visual assistance you need right at your fingertips. Understand the rationale and scientific evidence for choosing the most effective drugs and techniques. Optimize outcomes, reduce complications, and minimize risks by adhering to current, evidence-based practice guidelines. Apply the newest techniques and latest knowledge in neuromodulation. Access the fully searchable contents online at expertconsult.com.